Hotel Corona de Granada is situated in the city centre, 15 minutes’ walk from the city’s cathedral. It has an outdoor pool, squash court and free Wi-Fi. This hotel has large air-conditioned rooms. Each features simple, attractive décor, satellite TV and a minibar. The Hotel Corona has a restaurant, bar and cafeteria. A varied buffet breakfast is offered and room service is also available. The Corona is situated in the heart of the shopping district where you can find many shops, bars and restaurants. It takes 5 minutes in a taxi to the Alhambra and the city’s Palacio de Congresos Convention Centre is just 600 metres away. 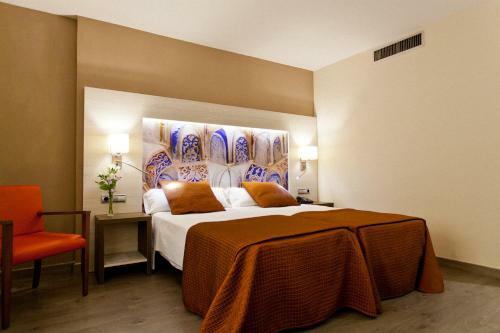 This hotel is 1802 metres from the Alhambra entrance, 1034 metres from Plaza Nueva (the absolute centre of Granada), 1781 metres from the train station and 3446 metres from the bus station.